The UPA created the policy of allowing foreign defence manufacturers to decide their partners for fulfilling offset obligations. Why is it having a problem with Dassault's selection then? The debate surrounding the purchase of 36 Rafale jets by the Modi Government from Dassault Aviation has one critical element that needs to be mentioned. It was an emergency purchase necessitated by the dwindling fleet of the IAF, massive fleet augmentation by both Pakistan and China in the last decade and negotiations between Dassault and HAL over production of Rafale in India reaching a dead end. The 36 fighters or two squadrons, one each for the western and eastern fronts, are expected to contain the downslide of the IAF fleet even as negotiations continue for bigger deals. Why 36 and not 126: An emergency purchase cannot be of the entire quantity but of the bare minimum requirement and thus the order was for 36 and not 126. Also, as mentioned by Defence Minister Nirmala Sitharaman, there is enough precedence of India opting for two squadrons initially while acquiring new platforms as was the case with acquisition of MiG-29, MiG-23 and Mirage-2000s in the 1980s and then going forward for follow-on acquisition of more platforms once IAF was reasonably acclimatised itself with the platform. Government in process of acquiring 229 combat craft in total: Further, the decision of the Modi Government to purchase 36 Rafale jets was complemented with RFP sent by IAF to HAL for an additional 83 LCA in Mark 1A configuration. Likewise, an RFI has also been issued for acquisition of 110 combat craft to be made in India by a shortlisted global aerospace manufacturer under the strategic partnership model. Therefore, India is in the process of acquisition of 229 combat craft for IAF in total. This nixes the false argument that Government is only buying 36 craft. 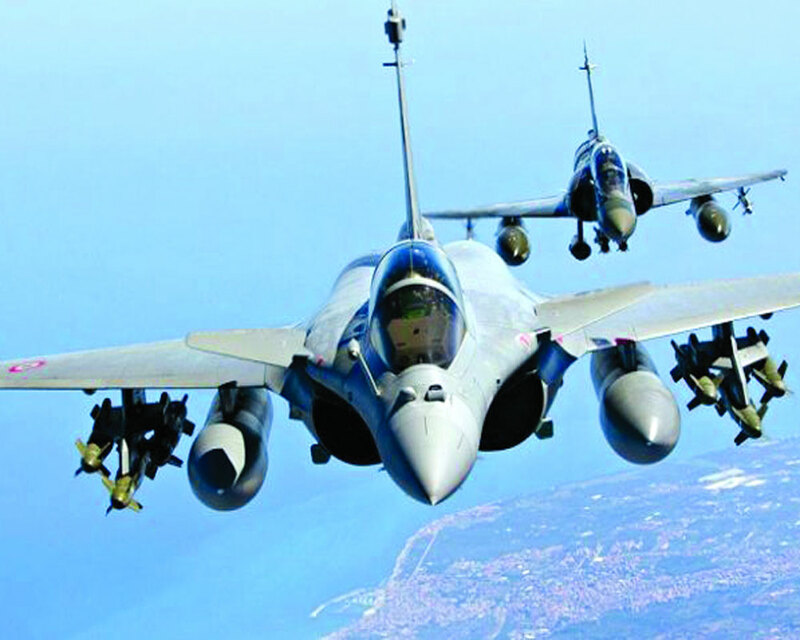 Why Rafale: Dassault Rafale was shortlisted for IAF during the UPA era. Spread over several months, IAF had already conducted extensive technical and flight evaluations, based on more than 600 parameters. Thus, purchasing Rafale by the Modi Government made sense. Just because of stalled negotiations between HAL and Dassault, it would have made no sense if the NDA Government had chosen some other jet or started the process all over again. What went wrong with HAL: In fact, negotiations between HAL and Dassault reaching a dead-end had little to do with the quality of Rafale and more to do with the refusal of Dassault to agree to the humongous man-hour quoted by HAL (2.7 times more than what Dassault needs to make a Rafale) for the deal, and also, the refusal of Dassault to guarantee the quality of production if the jets were to be built by HAL in India. Under the MMRCA project, HAL was supposed to manufacture 108 planes in India while 18 were to be procured in fly-away condition from Dassault’s factory. This was eventually scrapped. On the issue of why 36 Rafales ordered by the Modi Government are not being manufactured in India, the UPA should first answer why its purchase of aircraft like C-17, C-130J and P-8I Poseidon happened as off-the-shelf purchases from abroad instead of them being manufactured in India by HAL. If the rationale then was justified that the quantum was too small for licence production in India, the same logic applies now too for 36 Rafale. Myth surrounding CCS approval: A dubious allegation that has often been made by Opposition parties is that the Modi Government went ahead and announced the deal without necessary approval of the Cabinet Committee of Security or CCS. For the uninitiated, as per Defence Procurement Procedure, CCS approval is needed just before signing of the final contract with equipment manufacturer for a deal, and not before that. Incidentally, when Prime Minister Modi announced in France in April 2015 that India would acquire 36 Dassault Rafale in fly-away condition from France, it was a mere ‘Statement of Intent’ which does not need CCS approval. This was followed by intense negotiation on pricing over several months by the Contract Negotiation Committee. As per reports, the CCS approval was given in August 2016 followed by signing of the final contract in September 2016, which is absolutely in tune with laid down rules. Myth of Rs 520 crore price: During his speech in Lok Sabha in July 2018, Congress chief Rahul Gandhi had stated that UPA had negotiated a price of Rs 520 core for each Rafale combat jet. One should ask Congress if this includes the cost of missiles, avionics, spares and training. If yes, then where is the documentary evidence? If not, then what was UPA negotiating for Rs 520 crore? Why could it not conclude the deal with Dassault even then? In reality, for Rs 520 crore in the present day, one would not even get the chassis of a Rafale jet, leave alone a battle-proven, combat capable aircraft armed with missiles and avionics. In the battlefield, a fighter jet without requisite weapon systems, cutting edge avionics and spares is comparable to a bullock cart which may be good enough for air show acrobatics but not good enough for fighting wars and winning them. As per reports, the Rafales ordered by Modi Government would be armed with Scalp cruise missiles with a 500 km range, air-to-air missiles like Meteor with around 100 km range, Thales made Spectra Electronic Warfare Suite, RBE2 AESA radar and Thales’ Airborne Reconnaissance Observation System, namely AREOS. There are also reports of specific enhancements (possibly to carry Brahmos) to be made on Rafales for India. All these cost money. Therefore, in addition to the price of the basic craft negotiated by Modi Government for Rs 670 crore a piece (compared to Rs 737 Crore of UPA for the basic craft) the rest of the cost can be justifiably attributed to weapon systems and avionics. Additionally, the current deal for 36 Rafales also has an unprecedented 50 per cent offset and local sourcing clause, which means that Dassault and its tier-1 vendors would have to invest back around Rs 30,000 crore in developing aerospace capabilities in India through joint ventures with Indian companies, source components from them and thus eventually help Indian companies become part of the global aerospace supply chain. The irrationality of Rs 520 crore claim: The irrationality of the Rs 520 crore price quoted by Rahul Gandhi can be proved by the fact that for a basic platform of LCA MK 1A, HAL is quoting a price of Rs 463 crore a piece, which does not even include cost of logistics or weapon systems. Does it then make sense if it is claimed that a weapon and avionics-laced fifth generation Rafale (which is a generation ahead of the LCA MK1A), would be made available to India for a mere Rs 520 crore? If in 2011, UPA could spend $3.9 billion for upgradation of 25-year-old Mirage 2000s of IAF wherein it agreed to pay $2.4 billion to Dassault for upgradation, an additional $1 billion for complementary weapons and another $500 million more for developing a facility for HAL to get them modernised here with Dassault’s support, then one wonders on what ground Rahul Gandhi expects an armed Rafale to cost a mere Rs 520 crore a piece in 2016. Truth about offset: Perhaps the biggest misinformation that has been spread systematically is that the Anil Ambani Group has replaced HAL in the Rafale deal and that Ambani’s company would be getting Rs 30,000 crore of contracts. First, Reliance Defence has not replaced HAL. Rafales being procured by the Modi Government would be built in France and not in India. Therefore, there is no question of them being made by Reliance. Second, of the Rs 30,000 crore worth of offset and local component sourcing obligation of Dassault and its tier-1 vendors, namely Safran and Thales, the biggest beneficiary is DRDO. Recently, a television channel graphically explained how DRDO would get Rs 9000 crore worth of offset benefits through collaboration with Safran, which would help it in reviving the stalled Kaveri engine programme. The remaining Rs 21,000 crore worth of offset obligations are to be split among around 90 odd companies which are proposed offset partners of Dassault, Thales and Safran. Out of those 90 companies, Reliance has one joint venture each with Thales and Dassault. The list also includes other companies like the state-owned BEL, Samtel, HCL, Mahindra Aerostructures, L&T, IBM India, TCS, Tata Advanced Systems, Godrej & Boyce and Wipro Infrastructure Engineering to name a few. As per media reports, the total offset contracts accruing to Reliance Defence may be just over three per cent of the Rs 30,000-crore offsets in the offing. Incidentally, it was during the UPA era that a policy decision was institutionalised which stated, “The OEM/vendor/Tier-I sub-vendor will be free to select the Indian offset partner for implementing the offset obligation, provided the IOP has not been barred from doing business by the Ministry of Defence.” This is as per Section 4.3 of the ‘Defence Procurement Procedure-Revision of Defence Offset Guidelines’, approved by the Ministry of Defence on July 23, 2012. In other words, it was the UPA which created the policy of allowing the foreign defence manufacturers to decide their Indian partners for offset obligation fulfilment. If Rahul Gandhi had no problem with this policy during the UPA era, one wonders why he has a problem with Dassault’s selection of offset partners now?